Collectively our 3 presenters have had over 120 years of property experience. To avoid the pitfalls that ALWAYS occur at this stage of the property cycle. You’re determined to use property as your wealth creation vehicle. Times are changing, the market has moved on to the next stage of the cycle, with more traps and landmines along the way than there have been for many years. So now is the time to protect your assets while securing your future by learning about the next phase of the property cycle from experts who “have been there and done that” – successfully! We’ll teach you lessons from the past that will help you predict the future so you can THRIVE while many will lose significant sums of money in property in the next few years. With so many mixed messages and vested interests the most important tool you need is the unbiased truth. And that’s what we’ve been providing investors and the national media for the last 18 years. You see… we don’t sell property so our advice is independent and unbiased, so join us at this 1 Day training & let a group of Australia’s leading experts show you how to create a plan to become financially free through property without all the hype, nonsense and unfounded promises. Set things in motion so you don’t look back 5 years from now wishing you had picked up ‘that property’. Come and meet the people that can help you make it happen, get the tools you need to optimize profits and minimize risk and make this a year to remember! 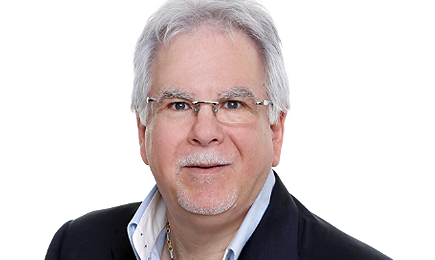 If you’ve been following my blogs you probably know that I am a property investor and developer and many people consider me Australia’s leading expert in wealth creation through property. In fact I’ve once again been voted Australia’s leading Property Investment Adviser and I’ve probably educated more successful property investors than anyone else in Australia over the last 18 years. Over the years my team and I have been involved in well over 3 Billion Dollar's worth of real estate transactions creating wealth for our clients. I have invested and traded through 8 major property cycles and I am prepared for the next stage of this cycle. Andrew is recognised as Australia's most respected and impartial property economists and one of Australia’s leading housing market experts. Dr Wilson is probably Australia’s highest profile housing market commentator, appearing regularly in the media. 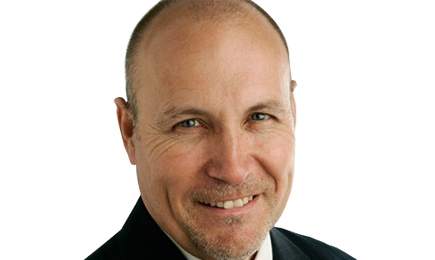 Ken is director of Metropole Wealth Advisory and gives independent expert advice for high net worth individuals and their families, professionals and business owners. Ken is a certified practicing account and over the last 13 years Ken has helped many of Metropole’s clients by providing individually tailored solution integrating the core disciplines of taxation, superannuation and property investment interwoven with finance, asset protection, succession and estate planning, personal risk insurances and philanthropy. Why the traditional buy and hold strategy just won’t work in the foreseeable future. Why this property cycle is likely to be different to previous cycle and why in the next few years the property markets won’t be anything like the past. The major factor that really drives property prices – it’s not location, affordability or what most people think? What will happen to the property market in each State and where the best property opportunities will be in the next few years. How many properties you really need to retire. The cycle of a typical property investors and what this means for you. The real difference between an amateur and a professional property investor. A bit about getting started in property renovations or development. My new updated strategy that replaces my older living off equity model. What’s really going on with the economy and our property markets? What surprises you should look out for? What strategies will work in this new market place and just as importantly won’t? Why you should ignore the commonly quoted property statistics and what you should be watching carefully. What you need to do differently at this stage of the property market. What property investors should look for at this stage of the cycle and things they must avoid. Tax tips you wish you had been told earlier. How to structure your property purchases to protect your assets and maximise your returns. What you need to understand about Self Managed Superannuation Funds. Whose name should you use to take finance or does it really matter? Different ways to set up JV partnerships and ownership. How the wrong use of trusts can cost you dearly. Efficient use of estate planning and asset protection. How to leverage the money in your SMSF to buy property to get a much bigger return with the use of a geared strategy into direct property. How to pass your assets to your children without the fear of losing it to their spouse in the event of their divorce or paying more tax than you have to. The strategies and techniques that the rich use to legally minimise stamp duty, capital gains tax, land tax. How sell properties and pay no tax. When one transfers from accumulation to retirement one must have the property in the right structure to avoid the tax and costs that accompanies this transition. We will be covering topics to suit both beginning and advanced investors, and this year there are a heap of new topics on the agenda – there have to be – times have changed! So even if you have heard us before, you MUST still join us as we all will be discussing new material we have never taught in public before and that you won’t find in books. We have to introduce new ideas, as this market is very different from before! Of course we’ll be covering many of the basics you have heard before — but who knows? You may pick up a little distinction or two. In fact, I highly recommend you come with your friends, family and other people you spend significant amounts of time with. And I’ll tell you why … because people who are serious about getting to the next level personally or professionally know that a key factor is having the support and enthusiasm not just on the inside, but on the outside, as well. You want your spouse and your friends right there with you, operating with the same mindset, new insights, awareness and tools to catapult you to the next level of success. Doesn’t it just make sense to them operating from the same space? It’s so much more fun and exciting. That’s why when you join us, you can bring a friend for free! SECURE YOUR SEAT. THIS EVENT IS SURE TO SELL OUT, JUST LIKE IT DOES EVERY YEAR. 9 Smart finance strategies to grow your property portfolio in the current tough lending environment. 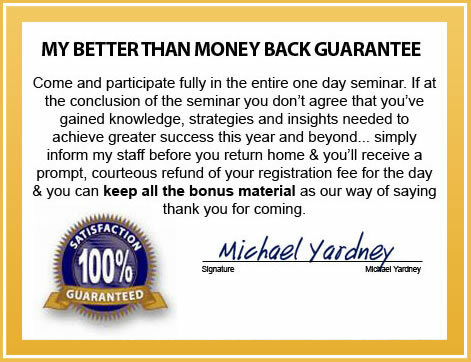 – A brand new video program where Michael Yardney and Andrew Mirams explain how to beat the banks at their own game and get them to lend you more. Success Secrets of the Rich and Happy – a must read eBook. Where to buy your next investment property – if you’re looking to grow your property portfolio you must read this eBook. How Many Properties Do You Need To Retire? – a great eBook from Michael Yardney. As a special thank you, we are giving you one FREE seat for a friend. Remember, you never learn less, so please avail yourself of the opportunities to learn more about becoming financially independent through property. I’m looking forward to seeing you on the day. P.S. If you think you have heard it all before and that this information is nothing new…you need this more than anyone! You stop learning…you stop earning. We guarantee there will be several things we reveal that you are not doing and you should be! P.P.S. Your chance to attend an event like this doesn’t come along every day. If you’re serious about achieving success in the next 12 months, this is your perfect opportunity to do it. Secure your seats now! Sorry there are no refunds – if you change your mind and can’t make it to this event, but we will gladly transfer your registration to a future event. This seminar does not provide individual advice. You will be advised of our usual disclaimer on the day, but we want to remind you that this session is not individual investment advice, but of a general educational nature. Any examples presented are for illustration purposes only as the information provided does not take into account your particular investment objectives, financial situation or investment needs. As always we strongly recommend that you should satisfy yourself independently (whether by expert advice or otherwise) of the appropriateness of any investment action. Whilst all care has been taken in compiling information in this webpage and the seminar is provided in good faith, it is not to be relied on as a substitute for professional advice.